Book and Frame Combo for Your Special Year. For selected years, we offer this one-of-a-kind book and frame combo. 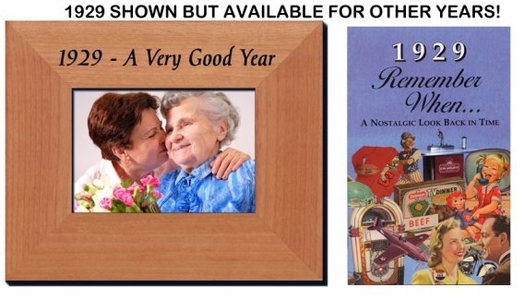 We combined the Remember When booklet of trivia for that year with a handmade lasered wood frame that says "(Your Year)- A Very Good Year"
For example, you can get the 1931 A Very Good Year frame combined with the 1931 trivia booklet at a special discounted price. Priced together- this is a great offer for anyone needing a gift for a birthday or anniversary!